Spacious room with indoor bathroom, king size bed or twin beds, balcony with daybed overlooking the vast resort parklands. Overlooking the vast resort parklands, Evason Rooms offer the perfect combination of comfort and modern conveniences. The airconditioned guestrooms has a sitting area and a king or twin beds depending on your preference. 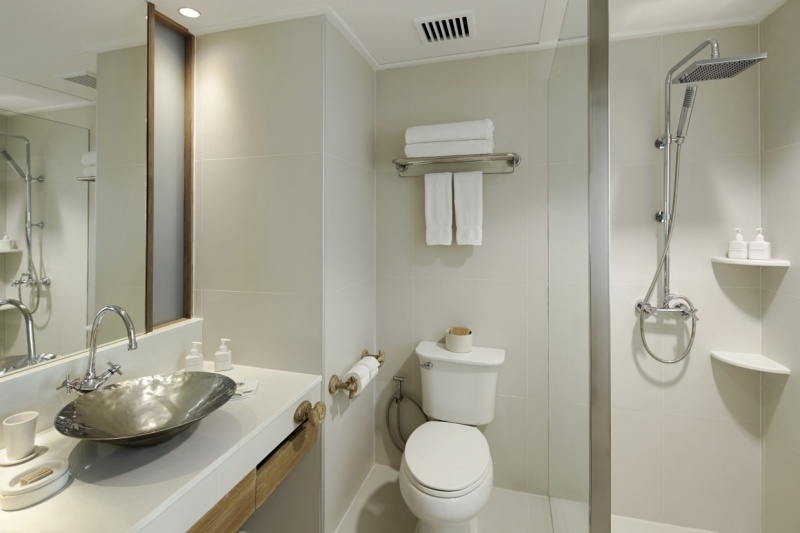 Rooms have ensuite bathrooms with rain showers and are finished with natural fabrics and calming hues. Spacious room with king size bed or twin beds, indoor bathroom with rain shower and large terrace with outdoor daybed. With a large terrace featuring an oversized daybed overlooking the resort parklands or gardens, the Evason Studios offer the perfect combination of comfort and space. Ideal for those who enjoy being outdoors on the terrace. There is an ensuite bathroom with rain shower. The furnishings are natural materials and in soft hues. Families with two small children can also be accommodated on bunk beds in some Studios. Spacious room located near to the main pool. 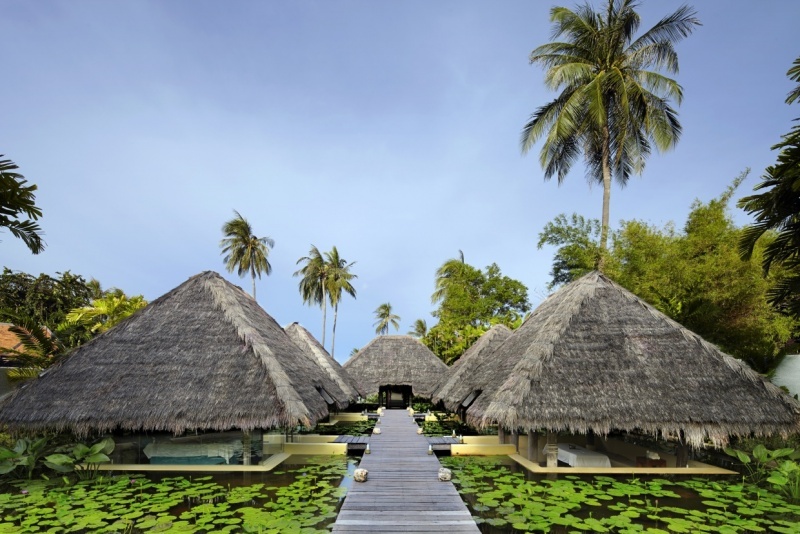 Open style bathroom with bathtub and rain shower, large terrace with outdoor daybed. Generously sized Studios with a large terrace featuring an oversized daybed overlooking the gardens. Located near to the main pool. Evason Deluxe Studios offer the perfect combination of comfort and space. Ideal for those who enjoy being outdoors on the terrace. There is an open style bathroom, double vanities, a separate bathtub and a rain shower stall. The furnishings are natural materials and in soft hues. Families with two small children can also be accommodated on bunk beds in some Studios. Large terrace overlooking ocean and pool gardens, king size bed, daybeds and open style bathroom with oversized bathtub. 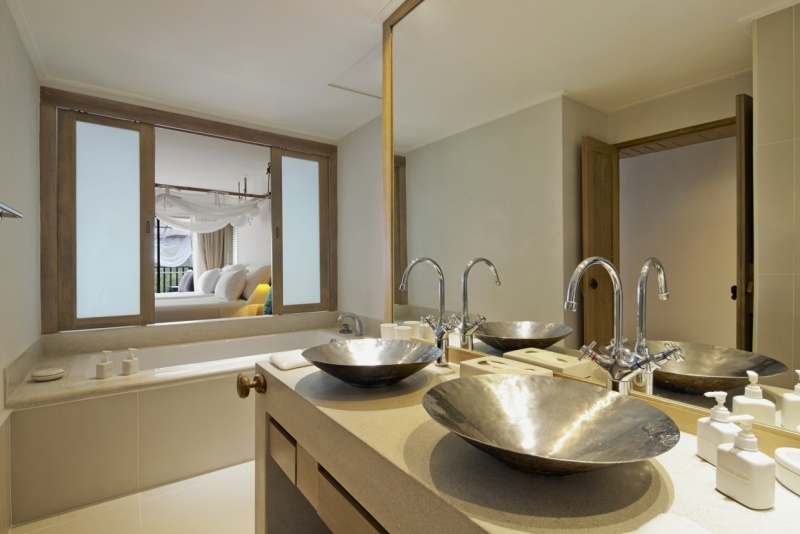 Evason one bedroom suite overlooking resort gardens with ensuite bathroom with separate bathtub and shower. Offers a spacious terrace with an outdoor daybed and dining table. Evason One Bedroom Suites are located on ground floor overlooking resort parkland. Suites are finished with natural fabrics and calming hues. Separate bedroom and living room with entertainment system, a dining table and pantry. The suites have extra large terrace and outdoor daybed and a dining table. 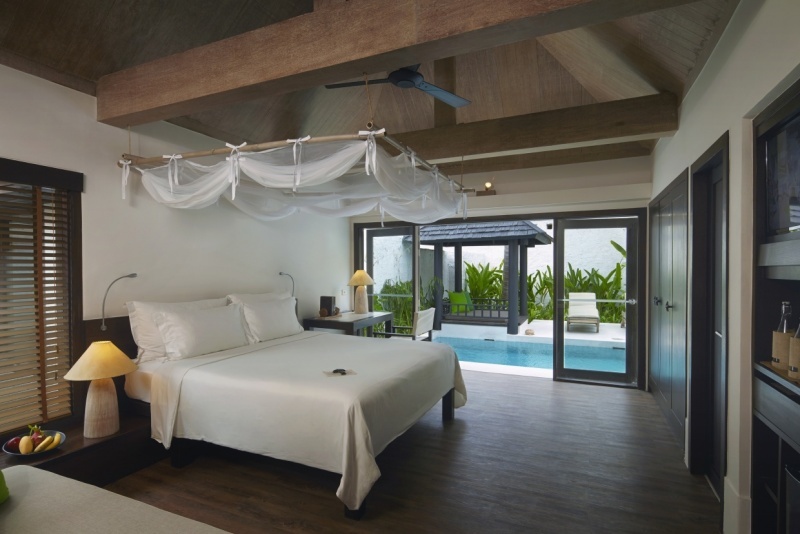 Two bedroom suite with connecting living room overlooking the resort parkland and gardens. Offers a spacious terrace with an outdoor daybed and dining table. 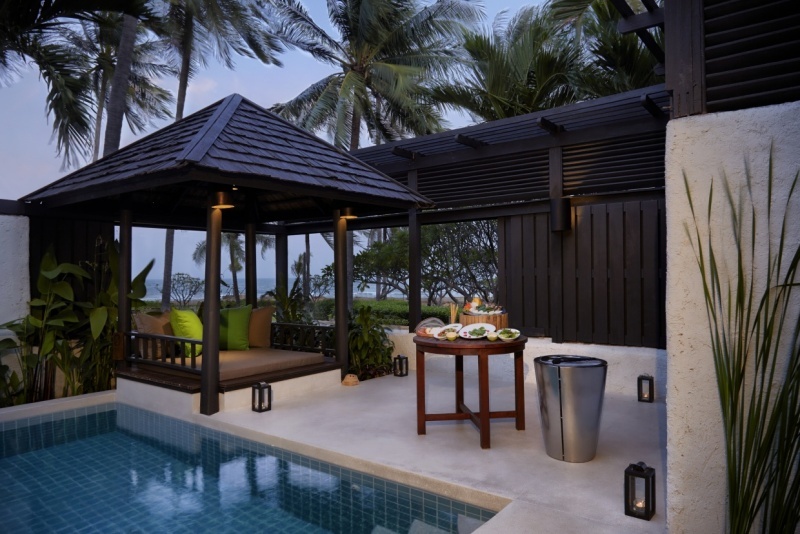 Private plunge pool and an outdoor garden shower plus a large open air bathtub, enclosed in a private walled garden. Garden includes two in-villa two sun loungers and a shady sala with a daybed. Fill in the form to book your stay and receive the final quote and confirmation from us. Thank you for booking your room with Evason Hua Hin. We will contact you shortly to confirm your room. A professionally managed children's club, with its own swimming pool, keeps youngsters of all ages entertained throughout the day. The emphasis at Just Kids! is on mind-challenging activities, adventure games and making learning experiences fun. A range of complimentary and chargeable activities are offered. Cancellation policy is one night of agreed rate will be charged if cancellation is made less than 7 days prior to arrival date or in the event of no show. Cancellation policy is one night of agreed rate will be charged if cancellation is made less than 14 days prior to arrival date or in the event of no show. Cancellation policy is one night of agreed rate will be charged if cancellation is made less than 45 days prior to arrival date or in the event of no show. Full deposit will be non-refundable if the booking is cancelled or in the event of no show.